Abundance really lives up to her name in the masses of flowers she produces. This is a great clematis for every garden and good for beginners as well. Reddish pink flowers with very textured veined tepals. Greenish-yellow anthers. This one works great for covering an arbor quickly. Some see this as a red clematis. Other see it as a pink one. Therefore I call it reddish pink. White flowers with deep, nearly black anthers. Flower tips may be greenish tipped with less sun. Very free flowering over a long period. This is one everyone should grow. 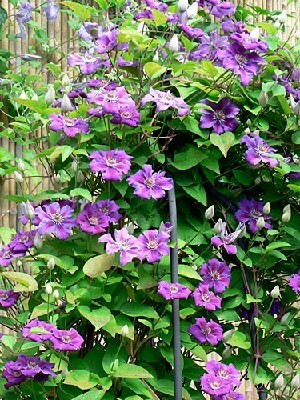 Looks great with a purple clematis like Etoile Violette who is another must have for the garden. Ascotiensis is a great performer not seen often in the garden. Large Blue flowers which lighten with age.Very hardy and free flowering. RHSA Award of Garden Merit. Ashva is very free flowering and easy to grow clematis. The flowers start out a deep rosy purple with a red bar then fades out to a pinky purple. The flower change to many shades as the flower ages. I am happy to be able to offer this clematis again.